Sometimes developing a relationship with a wine or winery is a lot like developing a relationship with a friend. It starts out with a casual introduction, but the relationship deepens over time. I first met Bouchaine at dinner at some friends’ house. Brady, my college bestie, and his partner Jonathan live just a couple of blocks away. This makes it wonderfully easy to get together for dinner from time to time. Jonathan first introduced us to Bouchaine at one of the first dinners we had together after we moved back to California. They’re members of the wine club and he mentioned that they joined just as much for the wonderful wine as for the fact that the tasting room staff was always so incredibly friendly. Cut ahead to summer 2016–I was invited on a press trip to learn about Napa Green, an environmental certification program for Napa wineries. The program aims to better environmental stewardship by integrating holistic management practices in the vineyard and the winery. The program is different from organic or biodynamic certification programs, as it assesses the entire wine growing/making process, aiming to reduce harmful inputs and conserve energy and resources. 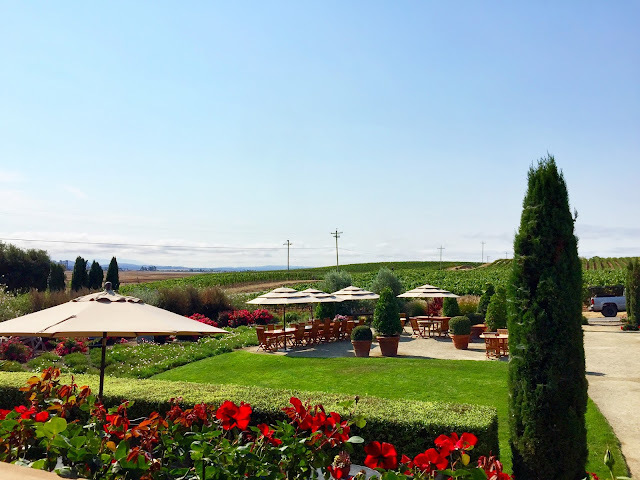 Bouchaine Vineyards in Carneros was one of the first stops on the trip. Winemaker Chris Kajani led the group on a tour of their beautiful vineyards. The tour was followed by a demo on falconry–so cool. Falconry basically uses birds of prey to scare off smaller birds that can eat huge quantities of sweet grapes, taking down huge percentages of crops if left unchecked. Little birds can be a huge problem, but other birds can also be great vineyard helpers in many different ways. 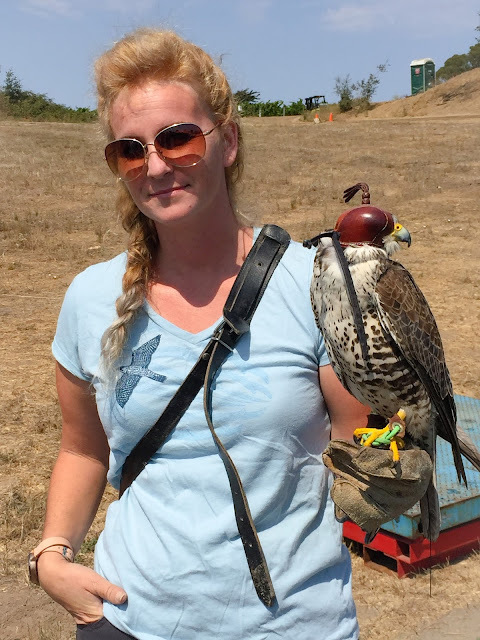 In this case, birds of prey are trained to circle the vineyard in shifts, acting like patrols, to keep little guys away without using any additional harmful inputs. They focus on Burgundian varietals and I have generally found them to make lovely, food friendly wines. 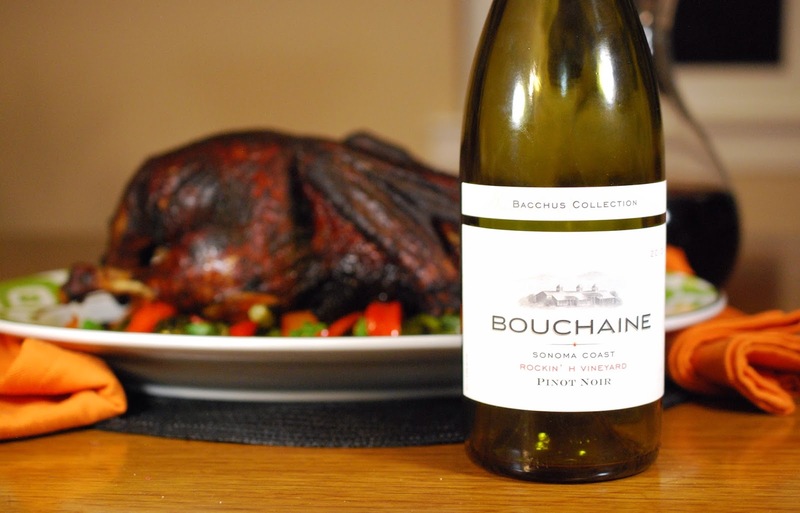 Bouchaine happens to be the oldest continuously operating winery in the Carneros district, which actually straddles Napa and Sonoma. The area has a pretty cool climate, which is perfect for Pinot Noir and Chardonnay. (They also make a really fun varietal Pinot Meunier.) The chillier temps help retain acidity in the grapes, while the California sun helps ripen the grape beautifully. 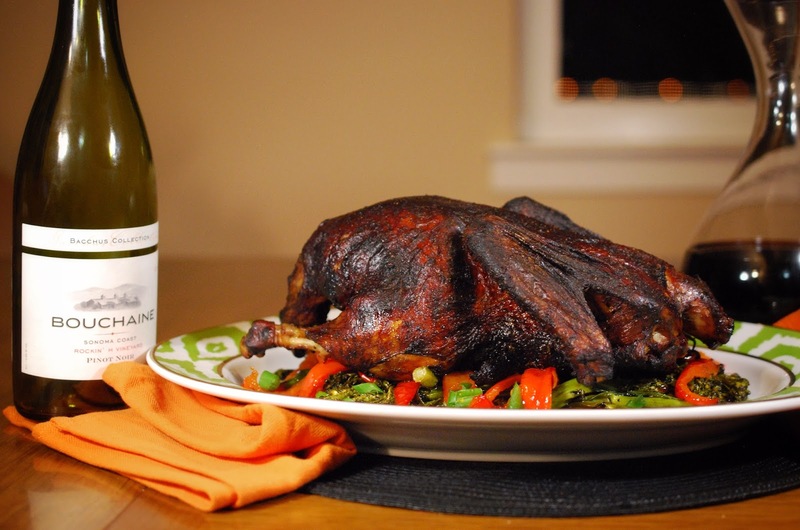 I created today’s recipe way back in the fall with the Holiday season in mind–Pinot is so perfect for Holiday feasts as it pairs easily with so many foods. However, life became kind of a roller coaster for a while and I didn't get to post it then. It’s a brand new year now, so I’m sharing it now to kick off 2018! It works out perfectly, actually. As a New Year’s resolution, I’m hoping to make a concerted effort to explore more of California wines and wine regions. It seems particularly important in the wake of last fall’s fire. Plus, I am here after all! Today’s wine is the Bouchaine Pinot Noir Sonoma Coast Rockin' H Vineyard 2013. On the day we popped open this bottle, Greg and I picked up notes of smoke, cranberries and raspberry pâte de fruit on the nose, laced with hints of clove. Darker notes of black cherries joined the red fruits of raspberry and pomegranate on the palate, along with some brambly notes, cedar, candied orange rind, and a little cola. There were also some spice box notes and light floral notes–kind of like a bowl of Christmas potpourri. It was on the fuller end of Pinot, but with bright acidity to carry it. It had fine-grained medium tannins and a moderately long finish. I would recommend decanting this–we initially picked up a little VA, but it blew off and the wine really opened up otherwise with time. Greg picked up a soy sauce note in the wine too, and the spice box note was reminiscent of Chinese five-spice. Together these lead us to our flavor profile. I decided to use a thick soy sauce to create a paste to coat the duck. Thick soy sauce has the texture of molasses and a much sweeter and more concentrated flavor than your average version. However, use whatever you have or try mixing regular soy sauce with a little actual molasses or some hoisin. (See this useful article from The Spruce on different types of soy sauce.) 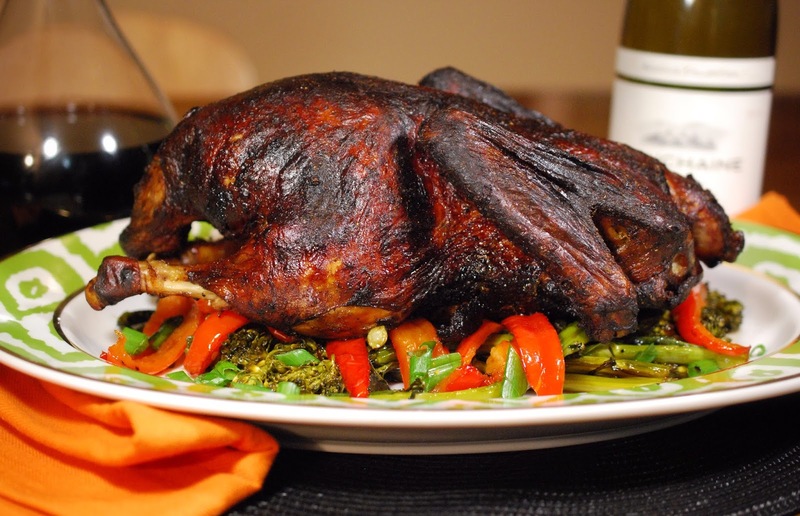 The thick soy sauce also helped give the duck a deep, dark, mahogany color. The wine and the duck were seamless together! The combo perfectly highlighted the soy and spice notes in the wine. 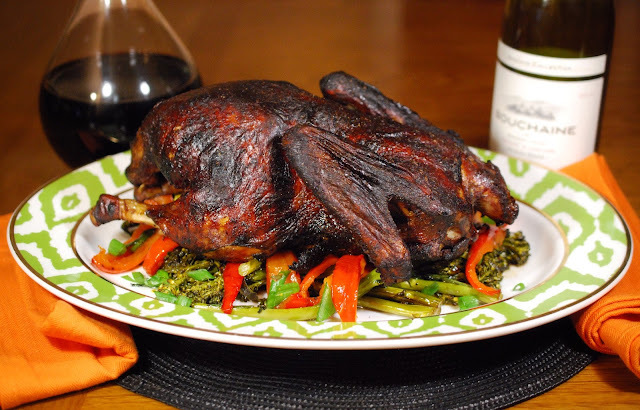 Interestingly though, the wine became more savory alongside the duck. Beautiful! I decided to serve some rice simply flavored with clementine zest, as well as roasted broccolini and peppers alongside the duck. Feel free to mix up the veggies. Admittedly, while they were fine with the wine, they didn’t sing either. There’s no need to be particular about these. One final note, I don’t recommend pushing the sweetness levels on the food any further than this. My initial impulse was to toss the veggies with a little hoisin sauce and it made the wine a little sour, so we ultimately left it off. If you need a little more moisture, opt for using the duck jus and/or some regular soy sauce instead. A few details taken from the tech sheet. 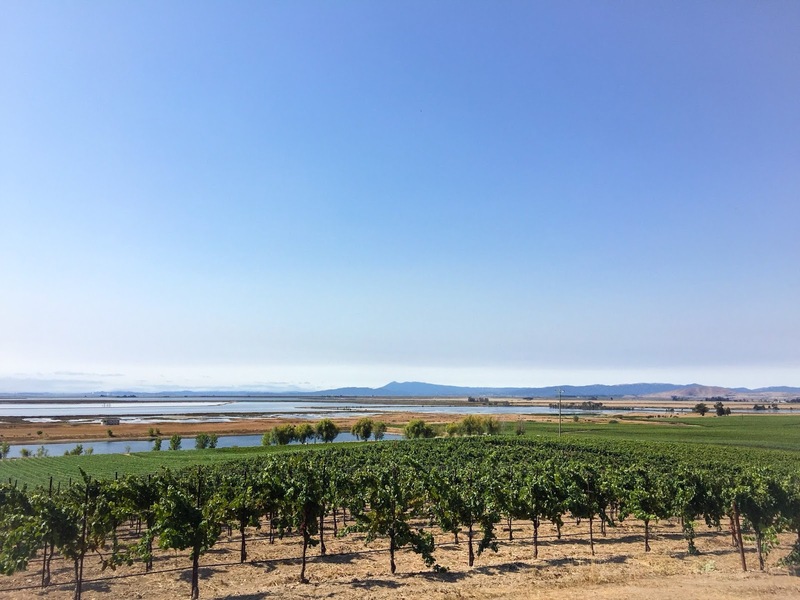 The Hendricks Rockin’ H Vineyard is located on the banks of the Petaluma River near San Pablo Bay. The site is located near the southern end of the Sonoma Coast AVA and enjoys a lot of cooling influence from the ocean. Apparently, it’s also lined by eucalyptus trees along one side, which sometimes give the fruit a light perfume. The Bouchaine site lists this at $40, which admittedly isn’t cheap; however, good Pinot Noir rarely is. (Pinot is hard to grow and finicky to make.) This is an Attainable Indulgence and a perfect Date Night Wine. 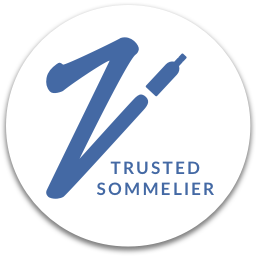 I think New World Pinot’s are particularly well suited for this; however, if you’re considering for other options look for a lightly oaked medium-bodied red wine–think Grenache, Merlot, or Zins that aren’t too tannic, alcoholic, or full-bodied. I also found Barbera d’Asti as a recommendation for a similar dish here. I’m also sure an off-dry aromatic white like a German Kabinett or Spätlese Riesling would be great here. Total time on this is about 2 ¾ and 3 hours. 2. Use kitchen shears or a sharp paring knife to cut away excess skin and fat around the neck and inside the cavity. 4. Score skin of the duck in a crosshatch pattern all over the breast down to the point where the thighs join the body using the shears, paring knife, or razor blade. Be careful not pierce through to the duck meat. 5. Combine the black soy sauce, Chinese five-spice powder, ginger, and the peanut oil, and a pinch of salt and pepper in a bowl into a paste. Taste and adjust seasoning. Rub the flavor paste all over the duck and set any extra aside for basting. Place the clementines and the garlic cloves in the cavity. Truss the duck or just tie the legs together with kitchen twine. 6. Place the duck, breast side up in a pan with a rack. Place in the oven and roast for 50 minutes. 7. Remove the pan from the oven. Transfer the duck momentarily to another platter. Spoon off of some of the excess fat from the pan and reserve it for roasting the vegetables. Pour off juices from the duck’s cavity to the pan, the flip the duck over, baste with the flavor paste, and return it to the rack in the roasting pan and continue to cook for another 50 minutes. 8. Flip the duck breast side up again, baste, and continue roasting until duck registers 165°F on an instant-read thermometer, about 50 minutes more. 9. While the duck finishes roasting, cook the rice. Bring the water/stock to boil in a pot. Add the salt with a generous pinch of salt and the clementine zest. Reduce heat to a simmer, then cover the rice and let it cook for about 20 minutes. (Start checking on the rice after 15 minutes.) Check to see if the rice is done, and if not, replace the lid and let the rice simmer an additional 5 minutes. Once done, remove from heat, then fluff with fork, toss with the green onions, and add additional salt if needed. Set aside and keep warm until ready to serve. 10. Toss the peppers and broccolini with some of the duck drippings. Season with salt and pepper. Spread the veggies on a baking sheet in a single layer. Place the veggies in the oven and roast for about 25 minutes, tossing the veggies half way through, or until the veggies are cooked through and lightly browned. Remove from the oven and keep warm until ready to serve. 12. Carve the duck and then serve with roasted peppers and broccolini and the rice drizzled with some of the pan drippings. You might have noticed that the duck is flipped from the typical 'breast up" presentation–that's only because one small bit of skin stuck from the breast stuck to the pan, so this side just looked better.